Did Pluto's Weird Red Spots Result from Crash That Spawned Charon? The dark spots of Pluto's Cthulhu region are clearly visible (dark band at lower left) in this image from NASA's New Horizons spacecraft, which made a historic first-ever flyby of the dwarf planet in July 2015. Mysterious dark reddish spots along Pluto's equator may be the aftermath of the giant impact that helped form the dwarf planet's largest moon Charon, a new study finds. This finding could also help explain the strangely wide variety of colors seen in distant objects in the solar system's Kuiper belt, researchers say. Cthulhu, named after the monstrous fictional deity from the works of H. P. Lovecraft, is about 1,850 miles (3,000 kilometers) long and 450 miles (750 km) wide, and with a size of more than 700,000 square miles (1.8 million square km), Cthulhu is larger than Alaska. These dark reddish spots may contain organic matter — specifically, tar-like materials known as tholins. It remains uncertain how these patches were created. While comets might have scattered tholins onto Pluto's surface, or light or high-energy radiation could have chemically reacted with the dwarf planet's surface to create these compounds, both of these activities would have darkened the dwarf planet's surface. That, however, is not consistent with the presence of bright water-ice bedrock seen there. The Cthulhu region of Pluto is seen in this annotated view of the informally named regions of Pluto christened by scientists with NASA's New Horizons mission. Now, researchers in Japan suggest this dark reddish material was created by the giant collision that may have given birth to Charon. Just as Earth's moon likely arose from the debris of a Mars-size body's crash into the newborn Earth, so has previous work proposed that Charon was the result of a cosmic impact. The scientists said that both Pluto and whatever struck it likely contained simple organic compounds typically found in comets, such as formaldehyde. They also reasoned that these molecules may have made their way into temporary pools of warm liquid water that would likely have existed after the impact melted a significant part of Pluto's surface. In lab experiments, the researchers heated soups of water and simple organic compounds such as formaldehyde for many hours. The concentrations of the organic molecules in these solutions were comparable to those found in comets. The scientists found these soups became darker and redder over time as complex organic compounds formed. After heating for more than 1,000 hours at 122 degrees F (50 degrees Celsius) or greater, they resembled the material in Pluto's mysterious equatorial dark spots. The researchers suggest that in the warm pools of liquid water that would have temporarily existed after the impact, simple organic molecules from either Pluto, the impactor or both could have formed more complex organic materials, such as tholins. 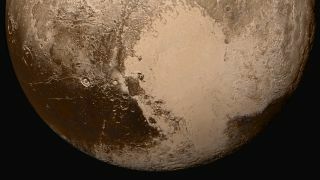 Therefore, the Cthulhu region and the other dark reddish spots on Pluto may be "a smoking gun of the giant impact origin of Charon," Sekine told Space.com. The researchers suggest that high-speed giant impacts may have occurred frequently in the outer regions of the ancient solar system. These collisions may explain the mysterious variety of color, brightness and density seen in large objects in the Kuiper belt, Sekine said. The scientists detailed their findings online today (Jan. 30) in the journal Nature Astronomy.